The Hustler – Did You See That One? Eddie Felson (Newman) is a pool hustler and a man without an identity. While he looks for ways to win, he’s missing something. After losing big to a hustler named Minnesota Fats (Gleason), Eddie begins to change things. He finds change in a rocky relationship with Sarah Packard (Laurie) and a new partnership with Bert Gordon (Scott). This is a wonderful film, based on the novel of the same name, by Walter Tevis (The Man Who Fell To Earth). The screenplay was written by Sidney Carroll (Gambit) and Robert Rossen (All the King’s Men). Robert Rossen also directed this movie. 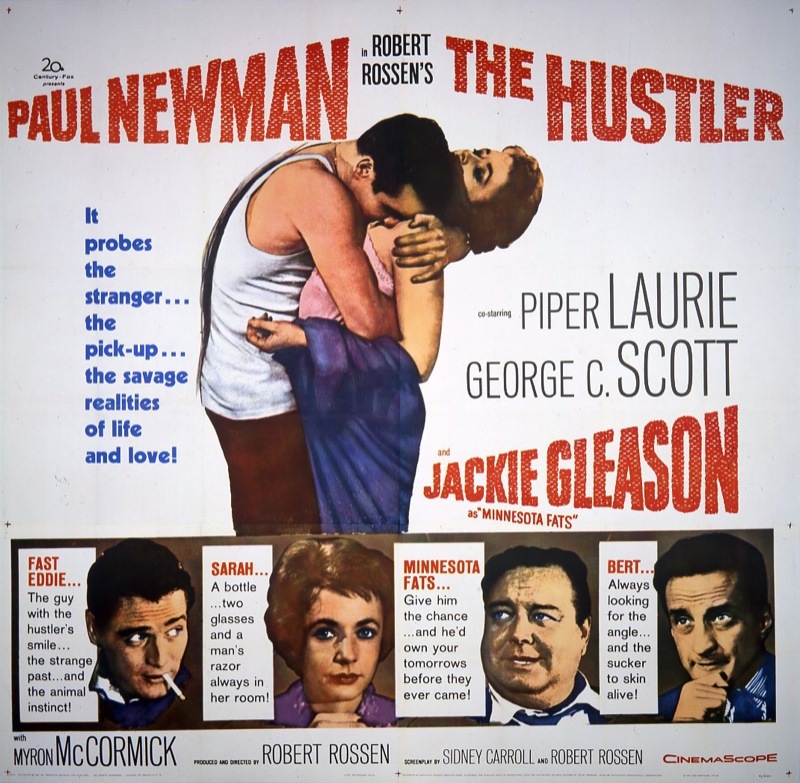 The cast features Paul Newman (The Sting), Jackie Gleason (The Toy), Piper Laurie (Children of a Lesser God), and George C. Scott (Anatomy of a Murder). This is a wonderful story that appears very simple at first glance. Yet, when you see the movie, you’ll find a wonderful examination of what success and failure can do to a man. The dialogue is direct and powerful, keeping the tension in the film going. The film also seems to be written without the intention of pleasing the audience with happy endings. (I’m not giving anything away by saying so.) Instead, the movie seeks out realism on a level that is rarely seen in a popular film like this. Overall, this story is great. The writing also earned Carroll and Rossen an Academy Award nomination for Best Adapted Screenplay. The film also earned Rossen a nomination for Best Director, and the film for Best Picture. The acting in this movie is also wonderful. Each of the stars earned an Oscar nomination for this movie. (Newman and Laurie for Best Actor/Actress, Gleason and Scott for Best Supporting Actor.) Newman is electrifying as he bounces around in a wide range of emotions. His performance takes advantage of every high and low throughout the story, and he’s wonderful to watch. 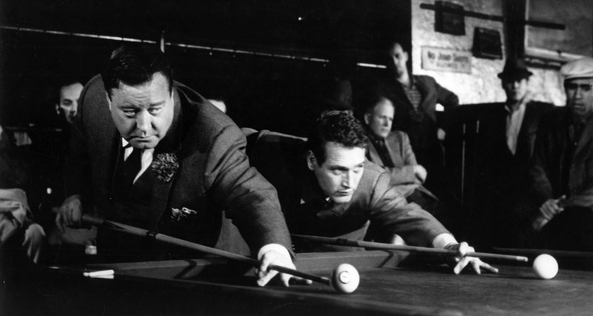 Jackie Gleason and George C. Scott are also great in this movie. Gleason does a great job with a purely dramatic role that underscores the theme of the film. Scott does an excellent job with an intense role in this movie. Like Gleason, he helps to highlight the meaning of the movie. Piper Laurie is amazing in this movie. She holds her own opposite Newman and Scott, bring out an emotional performance that’s essential to the success of this movie. Overall, all of these actors do great work in this film. The movie is also visually wonderful. The camera work had to be creative since Gleason was the only actor capable of making the pool shots for the film. The editing and cinematography come together to create a seedy and dark setting for the film. The costume work and set designs are also incredible. The film would go on to win Oscars for Best Cinematography and Best Set Decoration. This is a wonderful movie that has some great twists in the story. The tension starts off slowly, and builds to a roar by the end of the movie. If you’re a fan of great drama, this is one for you. I would also suggest this to fans of any of the stars in the movie. I give this one 5 out of 5 stars.